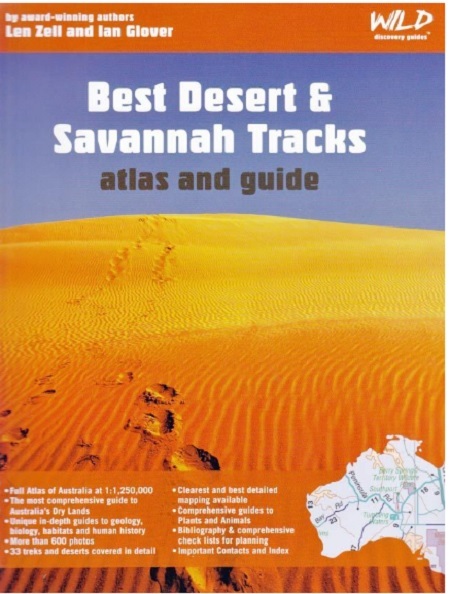 Best Desert & Savannah Tracks atlas and guide is the most comprehensive guide to Australia's Dry Lands. It has unique in-depth guides to geology, biology, habitats and human history. Comes with a full atlas of Australia at 1:1,000,000. Covers: Pinnacles, Far Eastern, Nullabor, Great Victoria, Little Sandy, Great Sandy, Gibson, Tanami, Great Central, Pedirka, Painted, Moon, Tirari, Simpson, Sturt Stony, Strzelecki, Eastern, Ninety Mile, Big and Little deserts. Author and/or publisher Len Zell and Ian Glover. (Wild Discovery Guides).